The 2016 American Community Survey data show that the share of young adults living independently continued to decline. Only 40% of young adults ages 25 to 34 lead their own household in 2016. In comparison, close to 46% of adults in this age group were household heads in 1990 and 2000. Rather, increasing numbers of young adults now choose to live with their parents or parents-in-law. This article shows that sharing housing with roommates, housemates and other non-relatives is also rising in popularity. While only 4% percent of young adults ages 25 to 34 shared housing in 1990, that segment increased to 7.5% in 2016. In addition, the rising portion of young adults (5% in 2016 vs 3% in 1990) chose to live with relatives other than parents. As a result, one in three (this adds up to more than 15 million) young adults ages 25-34 now live with parents, relatives or sharing housing with nonrelatives. There is little evidence that young adults merely postpone the decision to start their own household as the headship rates for the 35-44 year old group continued to decline as well. There is a clear geographic pattern with young adults in Midwest registering some of the highest household formation rates and young adults in densely populated coastal states (California, Florida, New York) showing some of the lowest headship rates in the nation. 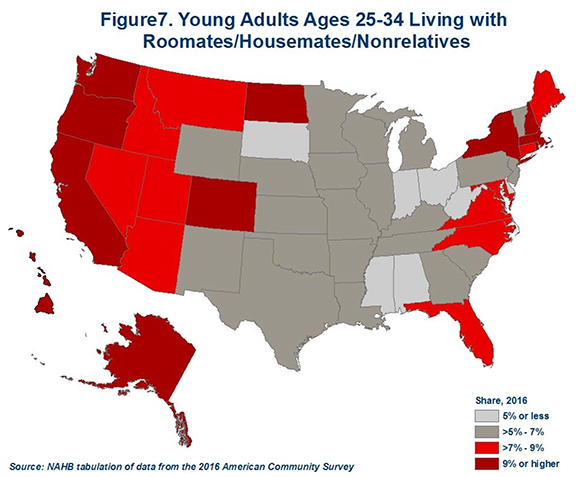 Sharing housing with unrelated housemates or roommates is more common among young adults residing in the coastal states. In DC, known as a city of transients, one in five young adults is a house sharer – the nation’s highest percent. The share of young adults living with parents or other relatives remained relatively stable from 1990 to 2000 (see Figure 1). Around 12.2% of 25-34 year olds lived with their parents or parents-in-law and 3.4% lived with other relatives in 1990. A decade later, these shares remained relatively stable. The share living with parents dipped just a bit to 11.6% and the share living with other relatives inched up to 3.7% (see Figure 1). The combined total remained slightly above 15%. The persistent and rising trend emerged a few years later. By 2006, 19% of young adults ages 25 to 34 lived with their parents or relatives. The trend continued its steady climb through the housing bust, a period of declining home prices, economic downturn and showed no sign of reversing even as an economic recovery took place. By 2016, the share of young adults ages 25 to 34 living with parents or relatives exceeded 26%. Out of these, more than 21%, or 9.4 million, lived in homes of their parents or parents-in-law and additional 5.2% (2.3 million) lived with other relatives. Similarly, sharing housing with roommates, housemates and other nonrelatives has been becoming more common over the last two decades. While only 4% of 24-35 year olds shared housing in 1990, the segment surpassed 5% a decade later, exceeded 6% by 2008 and reached 7.5% in 2016. As a result, over 3.3 million of young adults shared their housing with unrelated housemates in 2016. This represents an 80% increase since 1990 when only 1.8 million of 25-34 year olds were house sharers. When combined, young adults ages 25-34 living with parents, relatives and sharing housing with unrelated room/housemates account for 34% of the age group, or over 15 million people. In comparison, about 20% (8 million) of young adults chose these living arrangements at the start of the millennium. The growing tendency of 25-34 year olds to stay with parents, relatives or share housing with unrelated housemates means that the number of young adults starting their own households has been declining. The headship rates (the share of people who are household heads) for this age group dropped from almost 46 percent in 1990 and 2000 to 40 percent in 2016. Over the same years, the share of married partners co-leading independent households dropped from over 29% to under 18%. The rising numbers and shares of unmarried partners (from 3% in 1990 to 6% in 2016) were not enough to compensate for the steeper decline in married partnerships. As chart 2 shows, headship rates for young adults ages 24-35 remained relatively stable from 1990 to 2000, with close to 46% of young adults leading their own households. 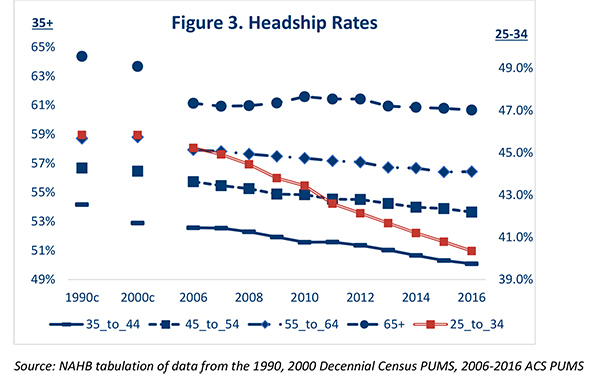 Even by 2006, the headship rate for this age group stayed in the same range with just a small drop that could be attributed to a switch in the data sources from the decennial census to ACS. The clear and consistent downward trend in headship rates became apparent during the housing bust and continued ever since. By 2016, the headship rates for young adults dropped to 40%. This translates into 2.4 million households lead by 25-34 year-olds that are currently missing from the housing market but could have been active players if the headship rates remained at the 2000 level. In fact, the decrease in headship rates is a universal phenomenon with all age groups registering declines since 2000 (see Figure 3). However, the deterioration in headship rates is most pronounced for the youngest 25-34 age group and they remain accountable for the largest number of households that had never formed. What Income Does it Take to Live Independently? Socio-demographic factors such as marrying and having children later in life are often cited as the reasons for the growing tendencies of 25-34 year olds to live with their parents, relatives or unrelated room/housemates. In addition, rising student debt burdens and lack of affordable housing can undoubtedly limit the ability of young adults to run their own household. 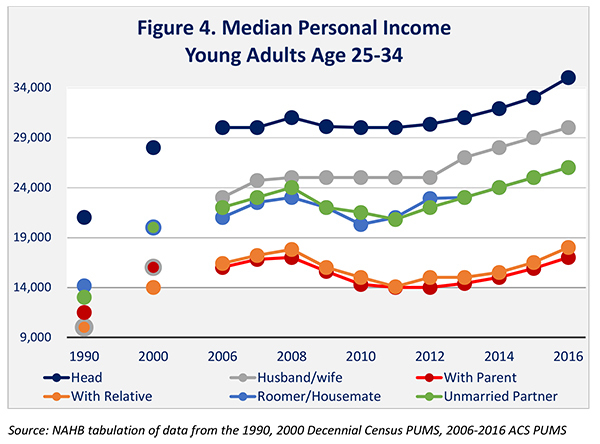 The importance of economic factors in driving a decision for independent living is highlighted in Figure 4 that compares median personal income of young adults with various living arrangements. Young adults running their own households have always been at the top of the pay scale, making about twice as much as those living with parents or relatives. As of 2016, half of 25-34 year olds in charge of their own households were making in excess of $35,000. In comparison, the median personal income for their age group was $26,000. Married 25-34 year old partners are second highest earners among young adults, with half of them making over $30,000. This represents a dramatic change since 1990 when spouses were at the bottom of the income distribution (in addition to those living with relatives) with the median personal income of $10,000. The fast rising median income of married partners was already noticeable by 2006 but became more pronounced after the Great Recession. To a large degree, it reflects the growing labor force participation of women and the increase in dual-income families. Close to 31% of 25-34 year old married partners were not in the labor force in 2000. That share fell under 22% by 2016. The rising preference (perhaps, necessity) of young females to keep their jobs after getting married can explain relatively higher income of married partners only partially. Their labor force participation and employment rates are lower compared to those of unmarried partners. Nevertheless, 25-34 year old married partners earn more than unmarried partners do ($30,000 vs $26,000 in 2016) with the gap widening after the Great Recession. These income differences suggest that financial factors and earning potential play an increasing role in determining who gets married and when. The socio-economic profile of unmarried partners is similar to those sharing housing with unrelated housemates. Meanwhile, the young adults living with parents or other relatives are at the bottom of the income distribution. Their respective median personal income was $17,000 and $18,000 in 2016, roughly half of what 25-34 year old household heads make. More importantly, this group registered little income growth since 2000 when their median personal income was $16,000 and $14,000, respectively. They earn significantly less than their peers do, partially because they are more likely to be unemployed or out of the labor force. Young adults who are able to strike out on their own are now less likely to become homeowners. 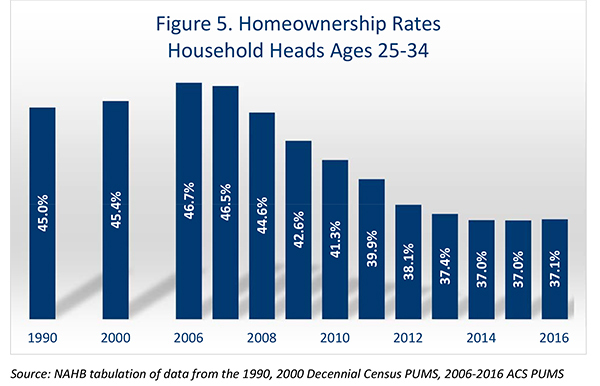 Although the homeownership rates of 25-34 year old householders stabilized in recent years around 37%, they remain well below the 45% mark registered in the 1990 and 2000 Censuses (see Figure 5). Not surprisingly, young head of households who own a home are the top earners in their age group. They also registered significant gains in personal income (though not adjusted for inflation), with the personal median income rising from $34,000 in 2000 to $45,000 by 2016. The analysis suggests that the income requirements for independent living, and especially for owning a home, increased over the years, leaving many young adults with stagnating incomes behind, at homes of their parents, relatives or sharing housing with room/housemates. The geospatial analysis provides additional insights into living arrangements of young adults (see Figure 6). California and New Jersey – states with the least affordable housing markets - register some of the lowest household formation rates in the nation, with only one out of three 25-34 year olds heading their own household. Florida and New York are close behind with the headship rates of 36%. Only Hawaii with its very expensive housing market has lower headship rates, 29%. At the opposite end of the spectrum are states in the West North Central division. 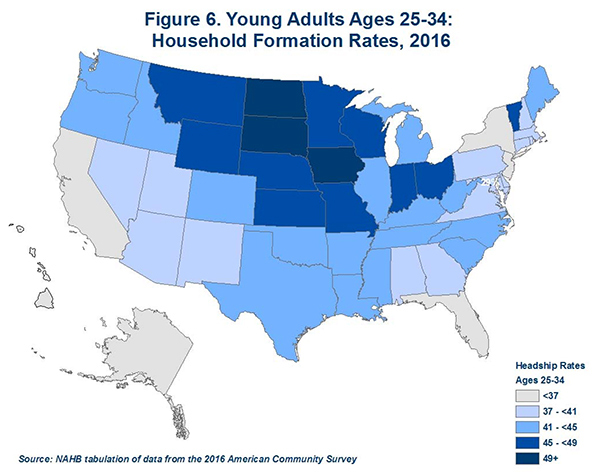 North Dakota known for the oil booming economy and Iowa recognized for its affordable housing markets are the only two states where more than half of 25-34 year olds lead their own household. Neighboring South Dakota, Nebraska and Kansas register similarly high headship rates in the 48-49% range. As might be expected, states with low headship rates among young adults tend to have relatively more 25-34 year olds living with parents. In Hawaii, 30% of young adults live with parents or in-laws. In New York, the share is only slightly lower, 29%. California, Florida and New York are next on the list with 26-27% of young adults living in parental homes. Consequently, the geographic distribution of 25-34 year olds living with parents largely mimics the headship rate distribution (Figure 6), with light colored states registering some of the highest shares of young adults living with parents. The popularity of house sharing also suppresses household formation rates across states but, statistically, this association is weaker. District of Columbia, known as a city of transients, stands out for housing the nation’s highest share of 25-34 year old house/roommates – 20%. At the same time, due to its relatively stable job market, DC’s headship rates are well above the nation’s average, with 45% of young adults leading their own households. The list of states with the largest segments of house sharers includes the states with the above average headship rates, such as Colorado and Oregon, where 11% of young adults are house sharers. North Dakota simultaneously registers the highest headship rate of 54% and one of the highest segments of house sharers, 9%. At the same time, the list includes several states with the lowest headship rates – California, Hawaii, New York - where one in ten 25-34 year old are sharing their homes with unrelated roommates or housemates. 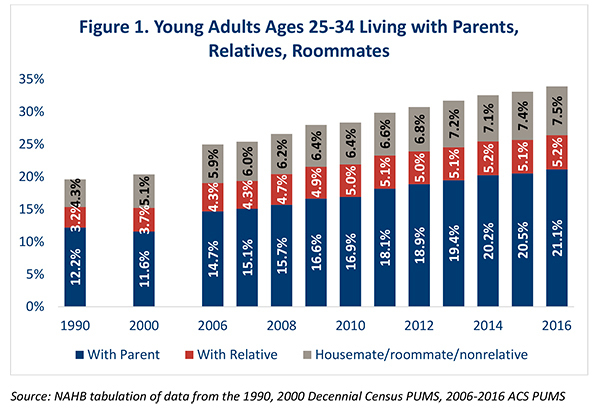 In conclusion, NAHB’s analysis of Census Bureau’s data show that over the last two decades young adults ages 25-34 demonstrated a growing tendency to live with their parents, relatives or unrelated room/housemates. 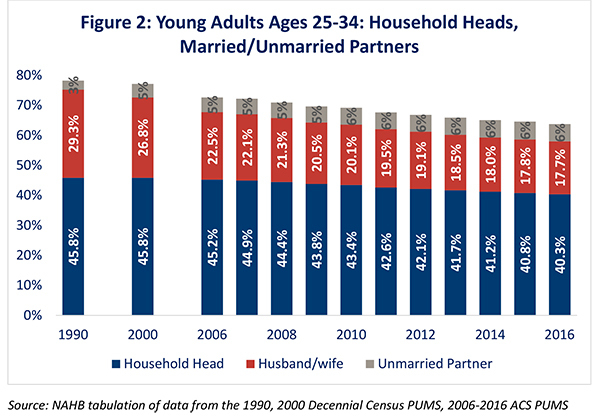 At the same time, the numbers and shares of young adults starting their own household as a household head or married partner have been declining. A rising share of unmarried partners has not been enough to offset the declining married partnerships. There is a clear geographic pattern with young adults in Midwest registering some of the highest household formation rates and young adults in densely populated coastal states (California, Florida, New York) showing some of the lowest headship rates in the nation. A young adult is considered to be living with parents if she or he is a child, stepchild, or in-law child of a household head and lives in the same housing unit. If a young adult is a household head and has a parent or parent-in-law living in her/his household, this young adult is not counted as living with parents. College students living in dormitories and other young adults residing in group quarters are not counted as living with parents, but rather counted separately. The estimates from 2006-2014 are based on the American Community Survey (ACS) Public Use Microdata Sample (PUMS). The estimates from the Current Population Survey (CPS) show a similar trend but the estimated share of young adults living with parents is lower. The author prefers the ACS based estimates for several reasons. First, the ACS has a much larger sample and is based on the decennial census long form that is has replaced. Consequently, it produces estimates that align better with the decennial census. Secondly, the young population in noninstitutionalized group quarters (mostly students living in dormitories) is clearly identified in the ACS and counted separately while the CPS counts them as living with parents. Lastly, the ACS identifies young adults living with in-laws, while the CPS does not have a separate in-law category in classifying a household structure. Consequently, any in-law children are most likely captured in the “other” category and omitted from the living with parents group in the CPS.